Step 1: Login if you have already an account or register to create your own. You can login or register from the top right side in the home page or from the bottom of it where there is the label "Login / Register". 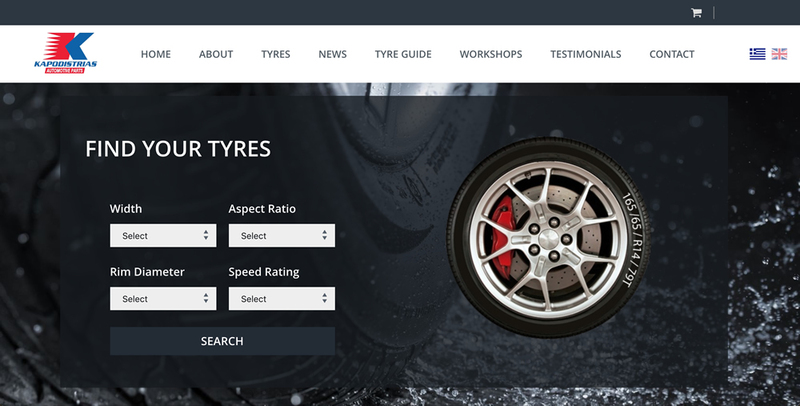 Step 2: Now, you can search for the tires you are interested in, by select the Tyre Width, the Tyre Aspect Ratio, the Rim Diameter and the Speed Rating. You can do this from the home page or from the category "Products" on the menu. Step 3: Now that the search is done, you can see the results based on the data selected in previous step. 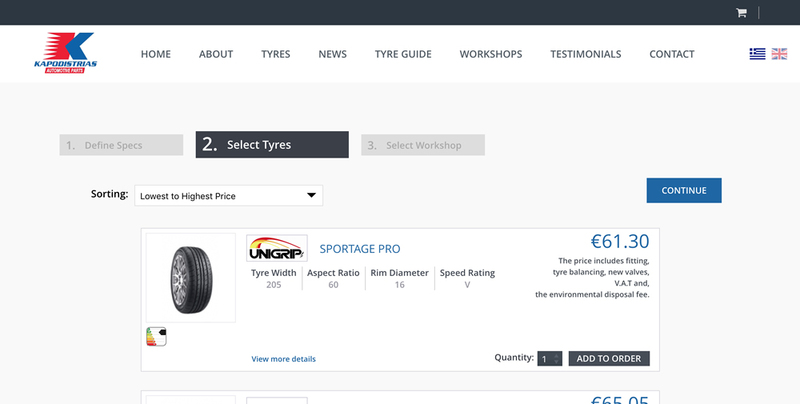 You can select quantity of the tyre you are interested in. 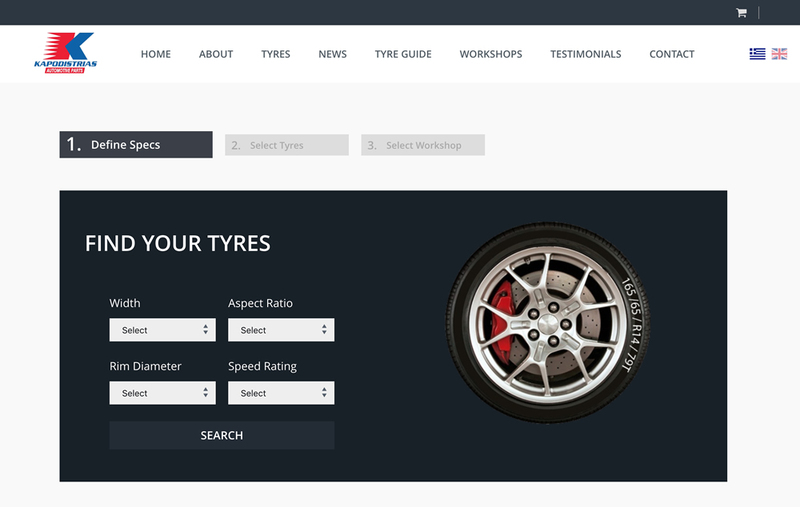 Also, you can add to order as many tyres as you want and in any model you want. You have the ability to add and remove products. 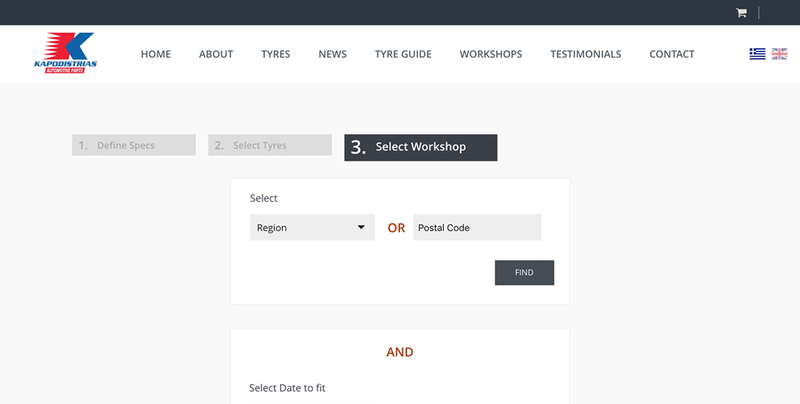 Step 4: Now you need to select from which workshop you wish to fit your tires and the day you want to fit. 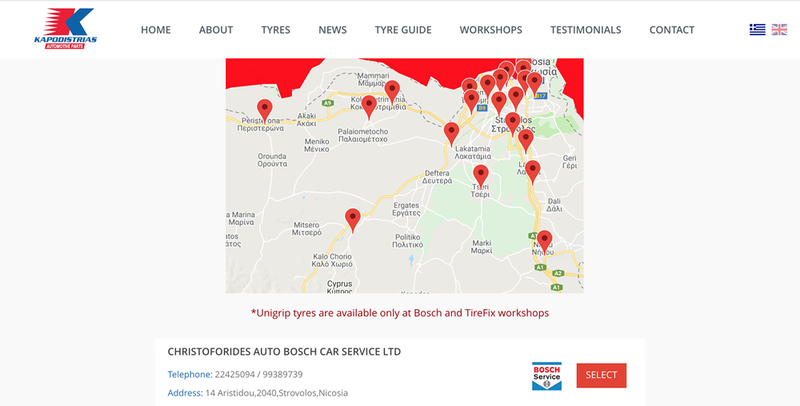 You can search workshops based on the region or the postal code. 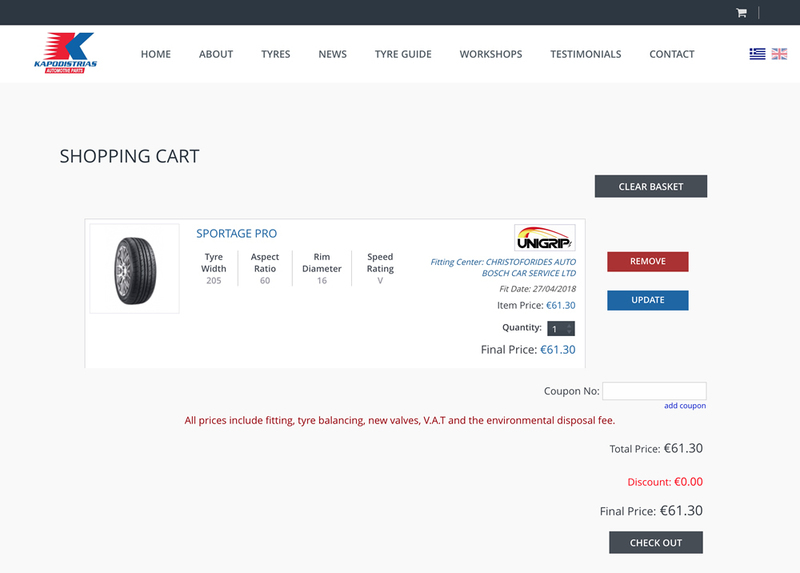 Step 5: When you select workshop, you will see the shopping cart where the products selected for purchase are shown. You have the ability to remove products and update the product's quantity. If you have a coupon, then you must type its number. When you are ready press "CHECK OUT" to proceed. 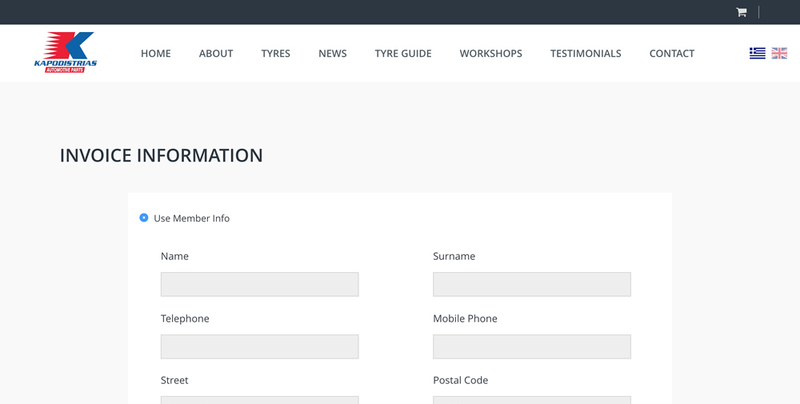 Step 6: In this step, you must select the invoice information. 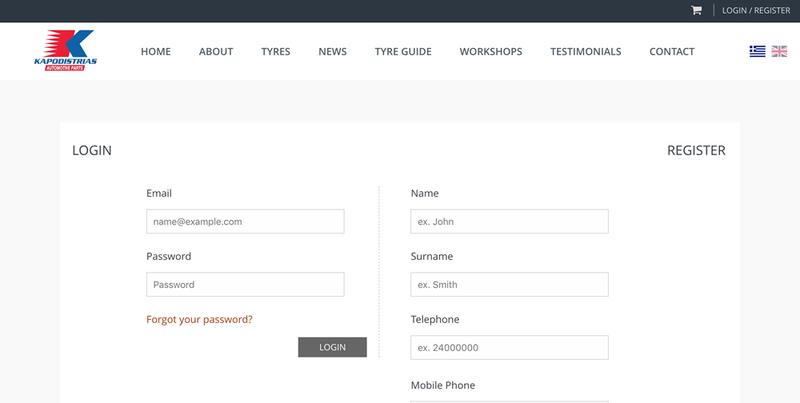 Whether it will display your registered data either with other data that you will fill in the second option. 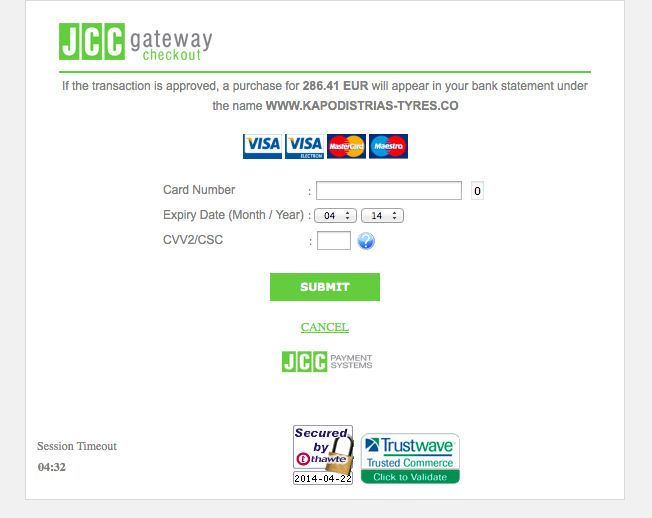 Step 7: You can proceed now with your payment filling the requested data. Step 8: After you complete your payment, you will need to print the coupons with your purchases or save them in your device. It is important to present these coupons at the workshop the day of fit, otherwise the fit will not be possible. If the payment was successfull then the caption shown on your screen will lead you in your order details with one click. You can, also, find your order details from the bottom of the page in category "Order History". 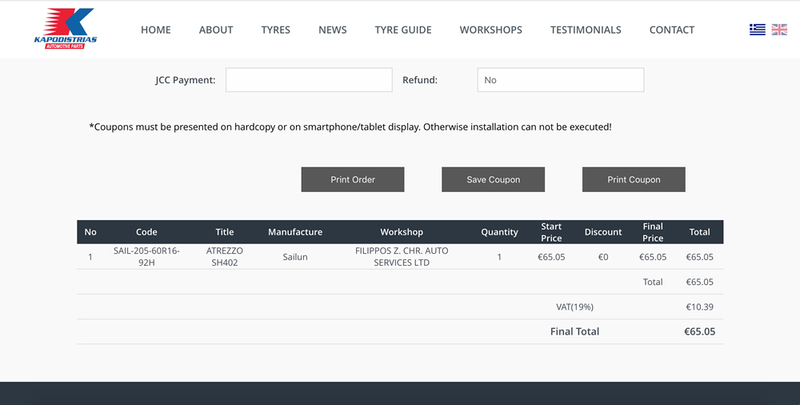 From this screen you can see the coupons of your order and print them or save them on your smartphone or on your tablet.